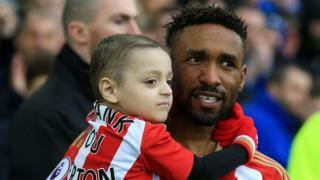 Footballer Jermain Defoe intends to spend "as much time as possible" with terminally-ill Bradley Lowery after his move to Bournemouth. The striker, who has confirmed he will be leaving relegated Sunderland, says he has "been blessed" to have been part of the six-year-old's life. Bradley's parents have said the youngster has just weeks to live. He suffers from neuroblastoma and is receiving palliative care at home in Blackhall Colliery, County Durham. England international Defoe has struck up a close friendship with the avid Sunderland fan, who was recently named a "child of courage". Confirming he is leaving Sunderland, the 34-year-old striker said his relationship with Bradley has been the "highlight of my season". "Away from football the relationship I've managed to develop with Bradley and what I've brought to his life and what he's brought to mine has been really special," he added. "It's just been sad to see him go through what he has been and he's only six. But I still feel blessed that I'm able to be in his life. "I've got so many great memories and moments that I have shared with him that will probably stay with me for the rest of my life now. So I'm just grateful for that." Bradley led out the England team at Wembley with his "best mate" Defoe for the World Cup qualifier against Lithuania in March. Defoe said he "didn't really know what to say" when he heard Bradley only had weeks left to live. "Every day I wake up and I will text his mum and ask how he is getting on and she will say he's OK. But the reality is that he's really struggling," he added. "All I can do is try and be there for him and the family. When I finish with England I'll try and get up there again before I go away. "I want to try and spend as much time with him as possible."